Not only is the Watzmann the highest peak of the administrative district and one of the highest of Germany. 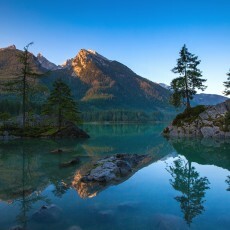 In addition, it is actually the highest peak which is located entirely on German territory. In comparison the Zugspitze (which is actually the highest peak of Germany) is located exactly on the boarder between Germany and Austria. The Watzmann mountain range actually consists of severeal independent peaks and sub-peaks. The highest, the so called “Middle-Peak” of the Watzmann, with its 2.713 m above sea level is followed by the “Southern Peak” (2712 m) and the “Hocheck” (2651 m). Fairly famous peaks lie in the east of the main ridge divide: the so called “Wife of the Watzmann” and its “Seven Kids”. Looking at the Watzmann from Berchtesgaden the shape of the mountain range can be interpreted as the wife to the left, followed by 7 subpeaks (“the kids”) and the main Watzmann massive (“the King”). However, a much more interesting explanation of this characteristic rock formations is given by a famous legend. Once apon a time a king – or shall we rather say a ruler – has reigned the region in a very cruel way, always longing for more power. As a punishement for his cruelties the king was turned into stone alongside his wife and the seven kids. Valentin Stanic, a theologian from Slovenia, was the first man to climb the Watzmann in 1800 along the easiest approach from the south. Much more challenging, however, is the climb through the enormous east face of the Watzmann. 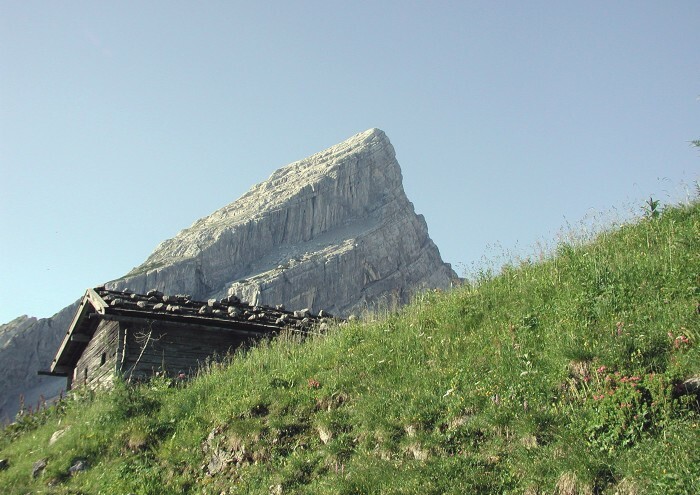 Actually, with an elevation difference of 1.800 m from buttom to top, this rock face is the highest of the Eastern Alps. 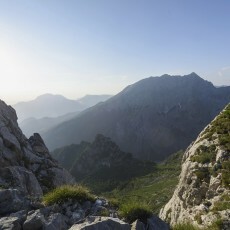 It was not before 1881 that the first ascent of the face was accomplished by Johann Grill (rather known as “Kederbacher”), a mountainguide from Ramsau, in company with Wiener Otto Schück. Another milestone of alpinistic history was set by none other than the famous mountaineer Herman Buhl himself. He managed the first winter ascent of the same rock face in 1953. For him, however, this heroic achievement was just part of his training and preparation for the first ascent of the 8.125 m high Nanga Parbat in the Himalayas. 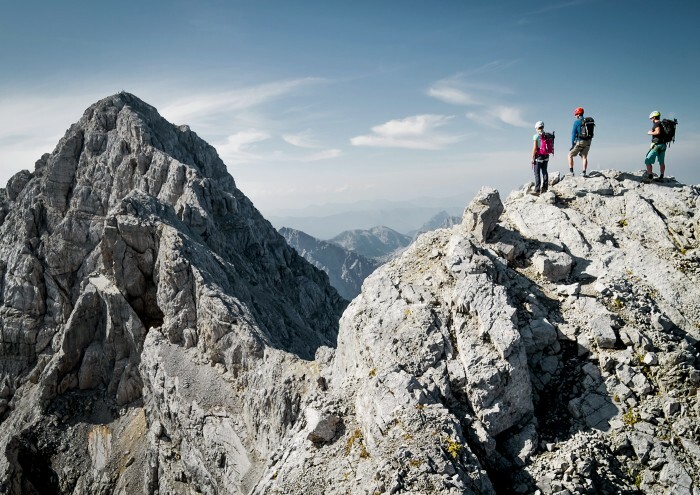 And today the Watzmann is a little gem of mountain range with a lot to offer: an easy stroll in the Wimbach valley, a family hike to the Watzmannhaus or scrambles, alpine ridge traverses and rock climbing routes. 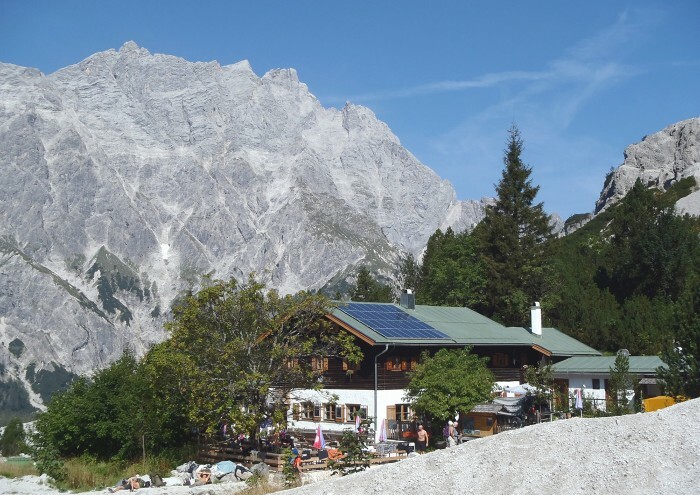 The most popular “base camp” for trips on the Watzmann is the alpine hut “Watzmannhaus”. 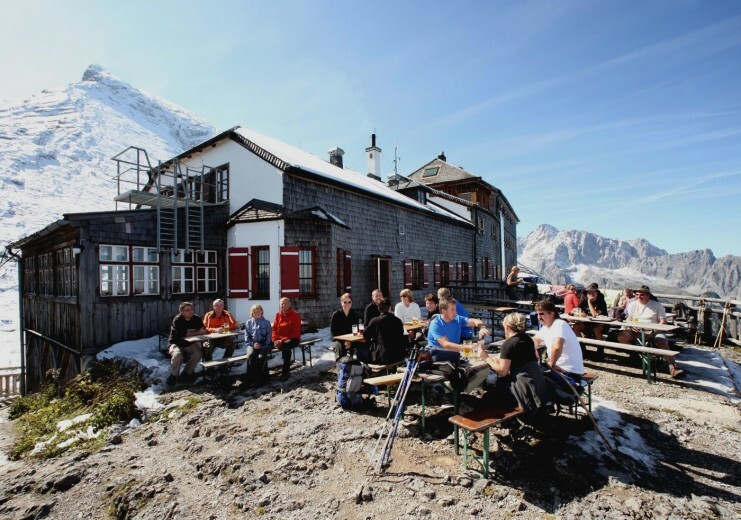 Built in 1888 at 1.928 m elevation, this hut has ever been managed by the German Alpine Club and offers food, drinks and quite luxurious accomodation to everyone. 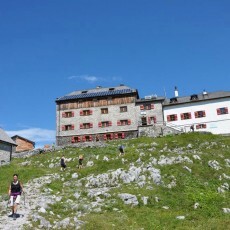 The Watzmannhaus is the ideal starting point for the long and challenging traverse of the entire Watzmann – Ridge, including the long and tiring descent into the Wimbach valley. 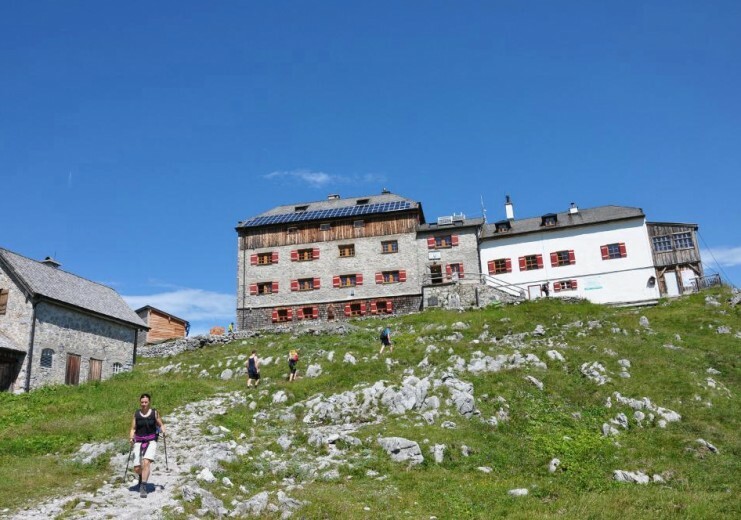 This itinerary is therefore only recommended for mountaineers with a solid endurance and a good experience in exposed alpine terrain. 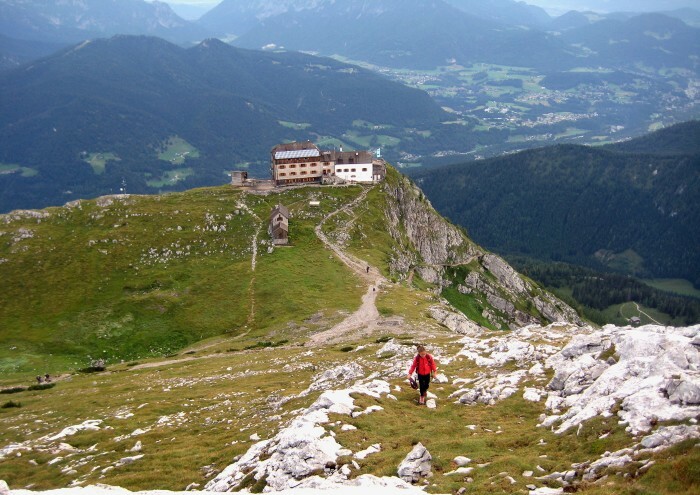 During the last century several efforts have been undertaken to establish a cable car to the summit of the Watzmann. Thanks to the enduring resistance of environmental NGO’s these plans never became reality. As soon as the National Parc Berchtesgadener Alpen was established these plans were definately forgotten. Around 3500 years ago, a large rock slide with a volume of about 15 million m³ was triggered in the Hochkalter mountain range. The debris was deposited in the Klausbach valley, where it acutally formed a dam for the Klausbach river: the so called “Hintersee” was born. If you want to know more about the landscape evolution and the rock slide, take a walk through the “Zauberwald” (Magic Forest)! 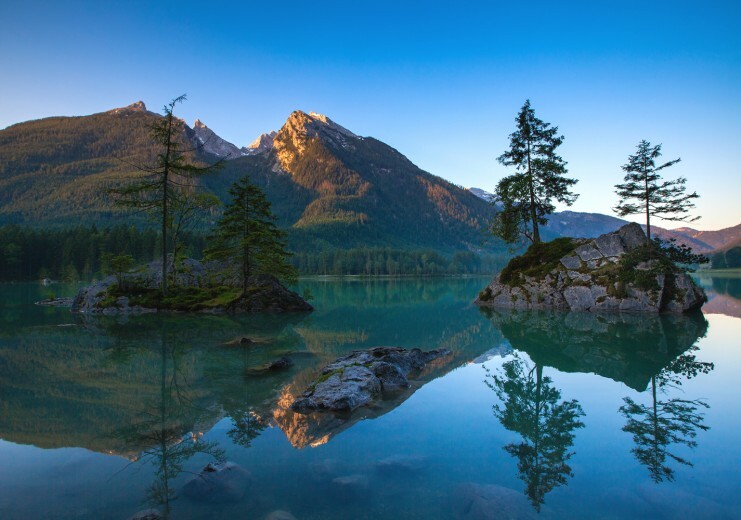 Due to its crystal clear water the Hintersee has become one of the most popular destinations when visiting Ramsau. In times when cellphone cameras and selfies were not yet invented, the Hintersee was a very famous spot for artists and painters. Already 100 years ago, famous local painters gathered at the “Malerklause”, not far from the restaurant “Auzinger”, in order to create paintings of the lake. During the winter months a beautiful hike takes you into the Klausbach Valley to a feeding ground for deer. 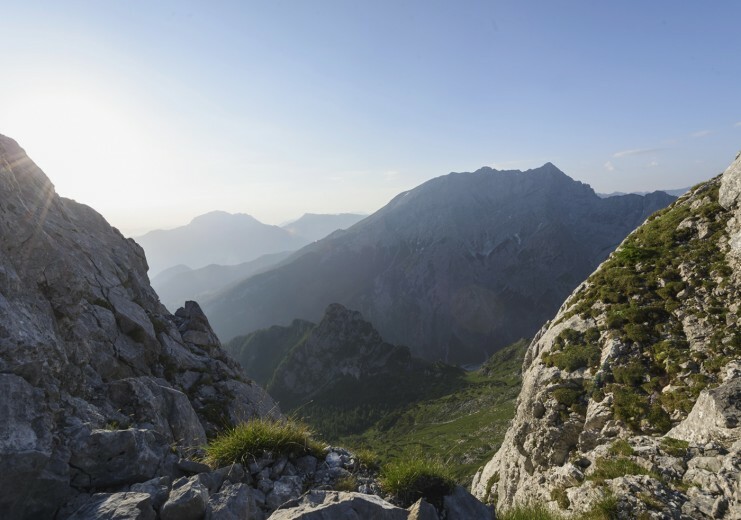 In the summer months a National Parc ranger takes you up into the mountains with a specific goal: spot the mighty eagle. 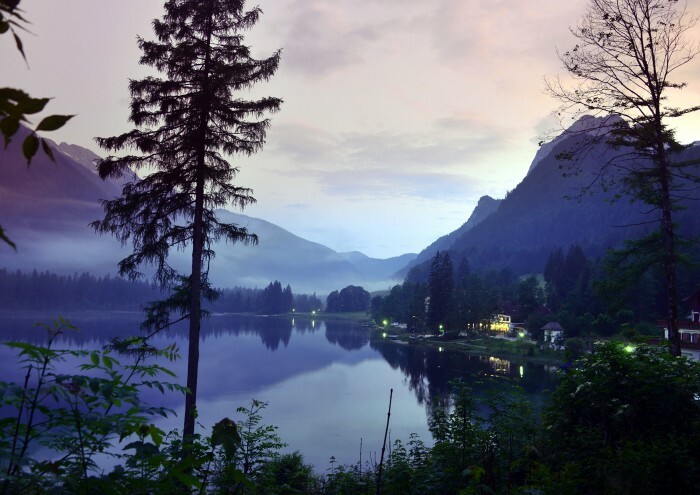 But also, if you just wan to take on some hiking trips on your own, Hintersee is a perfect starting-point. Trailheads into the National Parc, to traditional farming huts and alpine peaks start right at the lake. 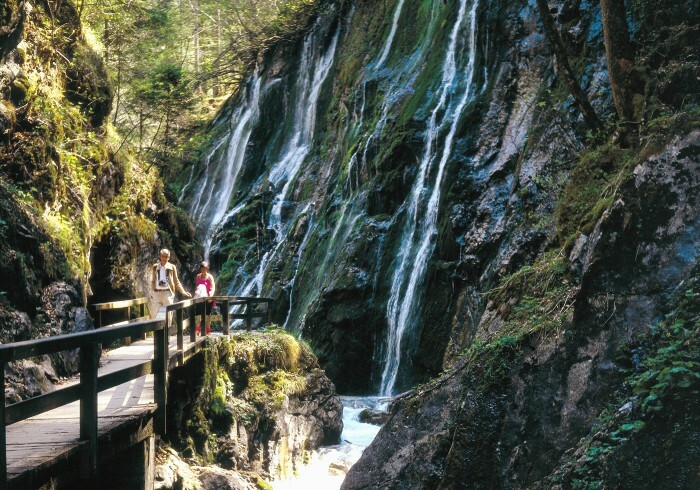 Between the two mountain ranges of the Watzmann and Hochkalter, the river Wimbach eroded deep into the surrounding rocks and created a spectacular gorge. In 1987 this gorge was made accessible for everyone. Before that time, only a couple of lumberjacks were brave enough to enter the gorge, in order to bring wood to the storage. Today the gorge is easily and safely accesible for everyone on bridges and safe pathways. However, be prepared to get wet. Caused by the strong rapids and waterfalls mist is caught inside the gorge. The gorge is a spectacular natural sight. Over time the river Wimbach eroded deeper and deeper into the rock, creating the gorge. In a sequence of waterfalls and large pools the river is making its way out of the gorge. The entry to the gorge is open from May to October each year. From the public parking “Wimbachbrücke” it is a 20 minute walk to the start of the gorge. Once you have passed the gorge, the valley widenes and allows great views on Watzmann and the flood plains of the Wimbachgries. 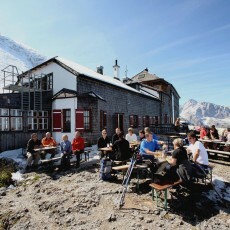 If you continue even further, your reward is great bavarian food at the hut “Wimbachschloss”. 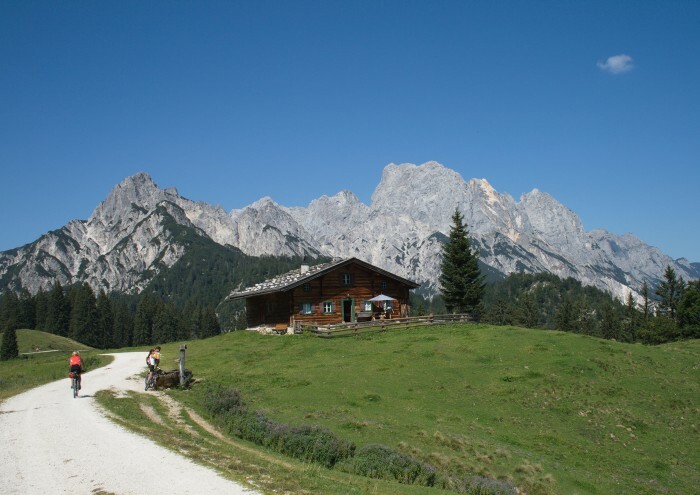 Alpine pastures are a very common sights in the Bavarian Alps and especially in the area of Ramsau and Berchtesgaden. In order to have additional sources of food for the cattle, the pastures were expanded into the alpine regions during the summer. 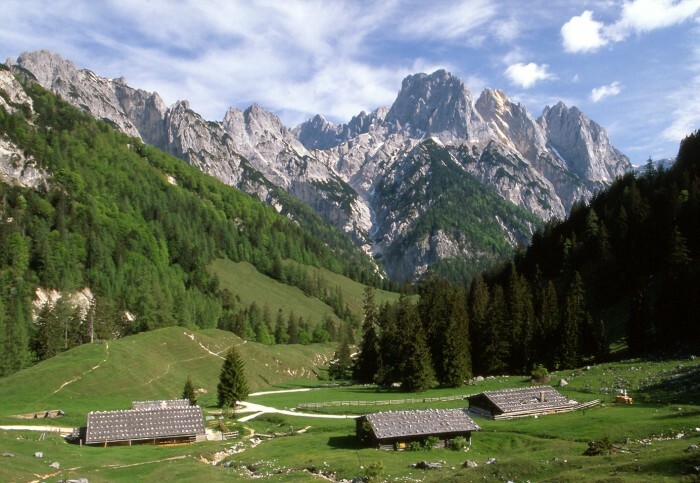 These alpine pastures are located between 600 m and 2,000 m above sea level. One of those farms was located that far away, that people and cattle in earlier times had to take a walk of severeal days to reach it. A lot of the paths that are now used as hiking trails, were originally used to bring cattle up or down from the alpine pasture. The typical huts that give accomodation to the farmers and the cattle, are called “Kaser”, a word that originated from Latin (casa = house). These “Kaser” are genereally built from material, that was available in the direct surrounding of the alpine pasture. During the summer months (generally May – mid October), these huts are guarded by farmers. Their duty is a very important one: use the milk directly at the farm to produce mountain cheese or butter. When you take a break from your hike at one of those farms, you can sample the local products and get refreshed with a fresh glas of buttermilk. 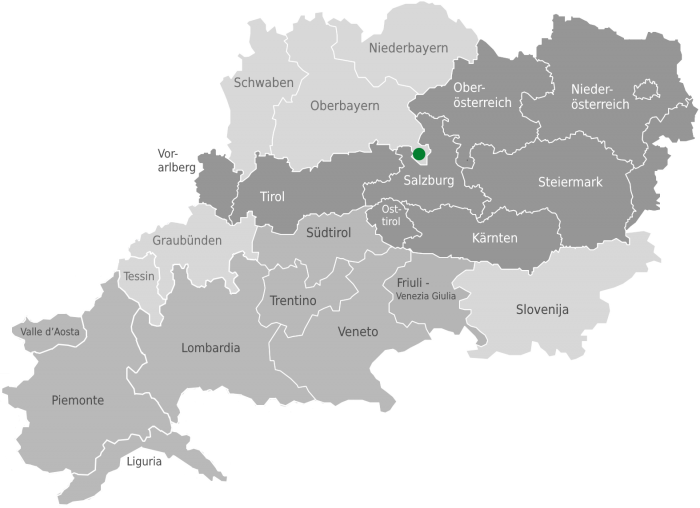 Schapbachalm, Kührointalm, Stubenalm, Halsalm, Ragertalm, Bindalm, Kammerlingalm, Kallbrunnalm, Mordaualm, Moosenalm, Anthauptenalm, Schwarzbachalm. 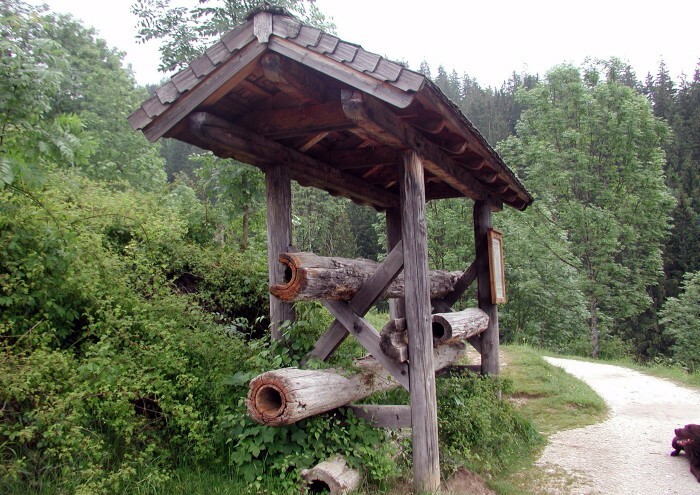 A pipeline for the "white gold"
From 1817 until 1960 salty water was transported from the salt mine in Berchtesgaden to Reichenhall in a wooden pipe – very similar to a “pipeline”. This historical “pipeline” had a length of 29 kilometers and played an important role for the economy of the whole region. The planning and construction of this pipline was a technical masterpiece for that time. In order to overcome the elevation gain, pumps had to be installed. A pump not too far away from Ramsau managed to push the water 356 m up and was considered as the largest existing maschine at that time. In 1961 a new pipeline was built on a much shorter track, so that the original pipeline had no more use. Today you can take beautiful hikes along the former track of the wooden pipeline.